Hi I saw your ad on Craig's List for the 100,000 hockey cards for sale http://toronto.en.craigslist.ca/tor/clt/1192396717.html . OK I will take one. 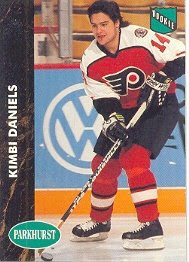 Give me Kimbi Daniels from his 1990-91 season with the Flyers. Should I send a cheque? Thanks!